The smallest in the range of Bosch’s proven and highly successful ‘Rotak’ range of electric lawnmowers, this little machine is the perfect tool for the job if you have a small garden, and although it doesn’t boast quite the range of features that its bigger brothers do, that doesn’t stop it from holding its own in small gardens. 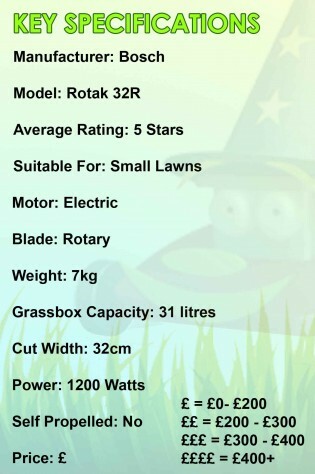 At just 7 kilograms in weight, the Rotak 32R can be comfortably operated by just about anyone, so if you’re getting older or you’ve downsized on your property then this mower is likely to be just right for you. Light though it may be, that doesn’t mean it lacks bite, its 1200 Watt motor is up there with the best of them in terms of what it will cope with, you need not have any reservations about cutting that thick start of the season jungle when this mower is at hand. Though not part of the ‘Ergo flex’ range the handle bar on this model is still comfortable and adequate to suit most people’s tastes, alternatively should you feel it necessary, for a few extra penny’s the Rotak 32R sister model, the Bosch Rotak 32 Ergoflex is fitted with the ‘Ergo Flex’ handle bar. A feature that has been retained from the more expensive models are the ‘grass combs’ on the front of the mower, to help with cutting the edges of the lawn neatly, by cleverly guiding the grass into the path of the blade. 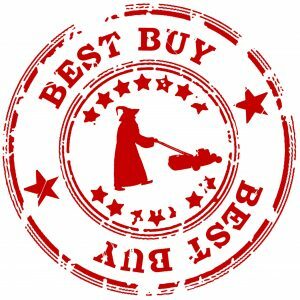 Incidentally, for best results we recommend taking your lawn mowing at a steady pace, with this model or any other, to ensure that you don’t miss any areas and that all the grass is evenly cut. Rear roller – for achieving lawn stripes, though this is not as effective as heavier mowers. Note that if you were to instead opt for the ‘Rotak 32’ (without the ‘r’) the roller would be absent, so check carefully before you buy! Weight – Just 7kg, you could almost operate this with one hand, though we wouldn’t recommend it! Storage well considered with a folding handlebar and cable tidy feature, which incidentally is also very handy for managing the amount of cable you require whilst mowing. 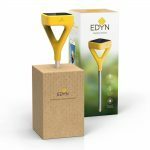 Only a 31 litre grass box – though this is only for small gardens, if you do use it on anything bigger you will find yourself emptying the grass box more often that you might like. However if the grass box were any bigger it would take away much of the appeal of this mower as a light, compact machine, instead it would be bulky and clumsy to operate. 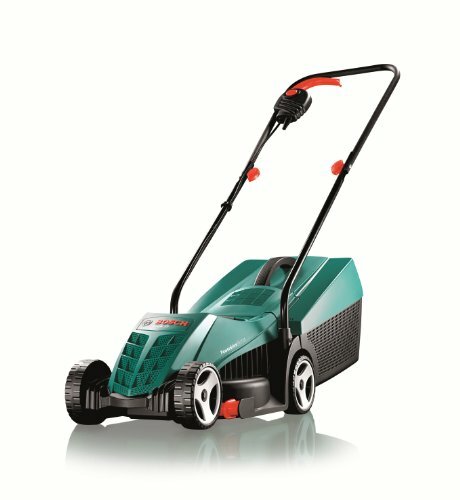 This is a decent and compact lawnmower, and like other Bosch mowers it’s got a powerful motor to ensure that you won’t have any gripes with getting the grass cut quickly and easily. It is a basic model though, so if you’re expecting precision results and well-defined stripes then this isn’t the mower for the job. If on the other hand you want something you can zip around the lawn effortlessly then you won’t be disappointed with this mower at all. please tell me where I can buy a Bosch rotak 32 lawn mower blade from I live in Mandurah WA and cant get one anywhere. The model number is N153 or 1PX4 thats the numbers on the mower Hoping you can help me. I’m UK base (England). If you can find one here and/or if. I can find one cheaper then all we need to work out, is the shipping cost to you. How much can that be??? You could always try asking on the Gardeners world forum site. (I’m a member and it is free to ask questions) We have a few members from down under and it is normally a pleasant site to ask questions on. Look out for PatE from your area of the world. Anything we can do to help you will only make our lives happier. Not sure how the payments will work out as I presume we/you will need some security like paypal or other. but the offer is there. Standard delivery from Royal Mail is not to bad. ( sorry it’s ridiculous!!!) and You would probably need a tracking service but it’s a start. Does your mower have a roller?? Is it 32 or 32R??? There is a difference.